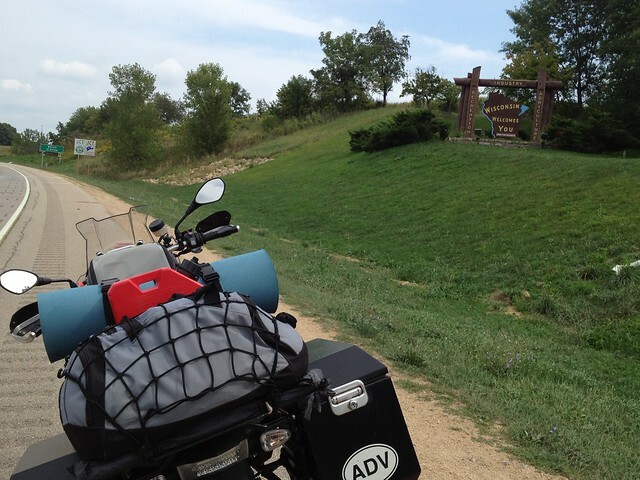 This is a continuation of my notes from my 2012 Cross Country ride across USA. 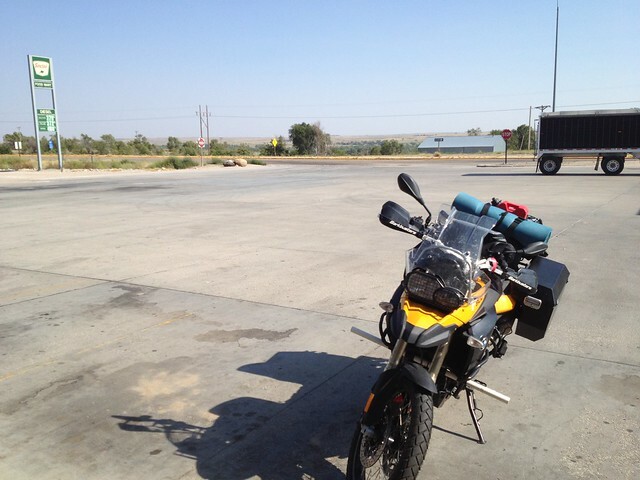 My previous post described my journey from San Jose, California to Boulder, Colorado. Here I will complete the rest of the journey. 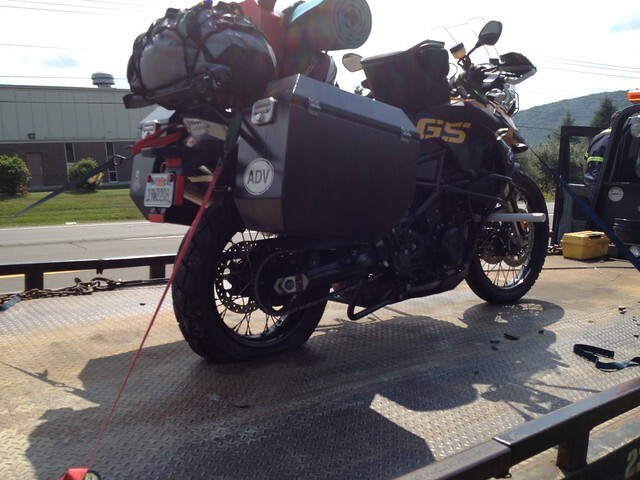 I am getting better at loading and unloading the gear off the bike. I have figured out the necessary bits that are needed for the stay. 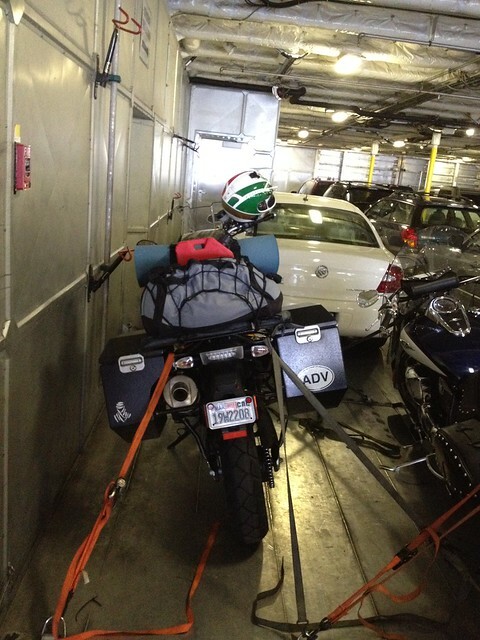 The remaining stay on the bike under a cover. Even with reduced effort to get going there is tremendous inertia to be overcome in the first half hour after waking up. I am filled with thoughts questioning the trip and search for excuses to not ride today. My mind play tricks to keep me away from the bike. I feel inordinately tired, depleted of any sort of excitement and just don’t want to move. I somehow manage to get ready. 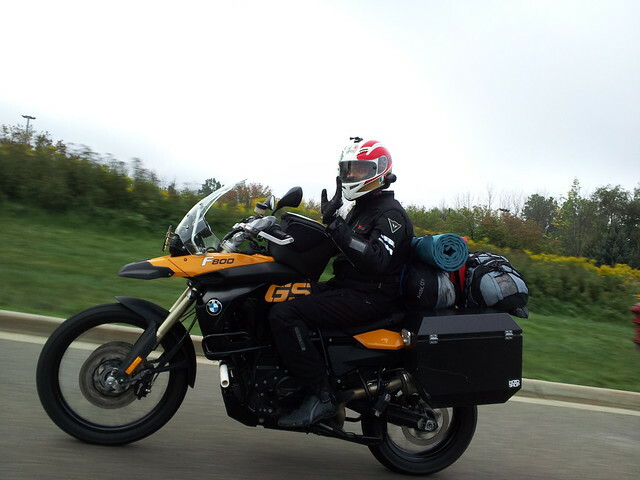 Once I get on the bike and start rolling, however, all questioning thoughts cease and I find focus and am filled with excitement about the day’s ride. Having said that I wasn’t too thrilled about today’s ride. 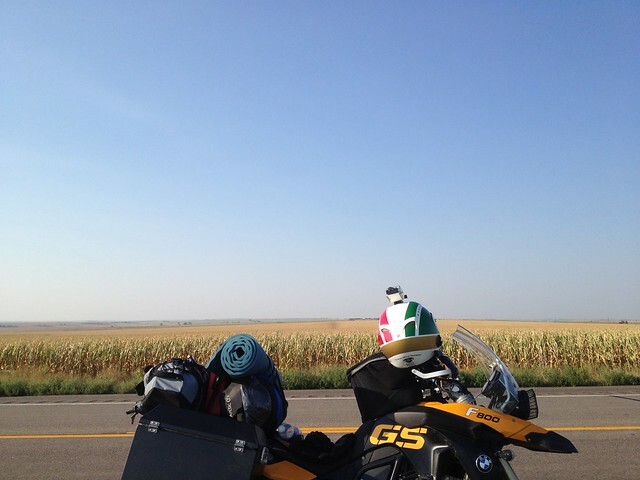 I had to cover around 400 miles of the Great Plains from Boulder, Colorado to Grand Island, Nebraska. There are two things that make this a tough ride. The temperature and the sheer lack of variety in the terrain. It is an endless parade of corn fields on both sides of the road. All shades of green, yellow and brown you can think of. Mostly brown. Since most of the clouds were stuck at the Rockies the great plains wasn’t going to get any respite from the blazing sun and heat up quite a bit. Nevertheless I was on my way and once out of the Denver city area I slowly watched the countryside repeat itself. 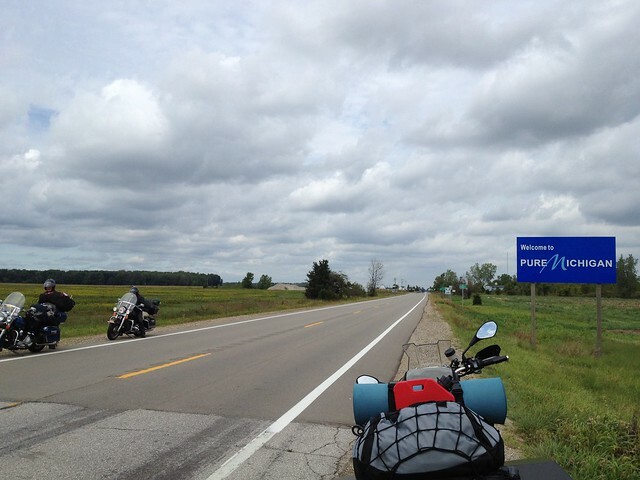 Based on a suggestion by a rider yesterday I decided to take US Highway 34 instead of Interstate 80. It is supposed to be marginally better than the interstate with no semi trucks hogging the roadway. However, there are many farming villages on the way which tends to slow down the pace but in return provide insights into the local american country life. US 34 allows a speed limit of 65mph. With almost no cops and very little traffic I was able to hit 80-85 mph regularly. Though I loved the lively pace and hence the chance to overtake all in my way I mostly went fast to help me stay cool. The temperature was consistently between 95-105 F. I was sweating buckets! I would stop every hour or so to drink water and replenish salts. I drank about two bottles of vitamin water and two bottles of water with electrolyte supplements. Nearly every time I stopped at a gas station, a local would look at my bike, me and then remark how hot it is to ride. At a stop sign for a road construction a worker asked me how I could be dressed completely in black for weather like this. I pointed at the vents in my jacket and pants while somewhat agreeing with him and moved on. There was a lot of construction on US 34. Most of the workers looked Hispanic. To keep myself entertained and not get beaten down by the heat I listened to music and set up my go pro to capture random photos. 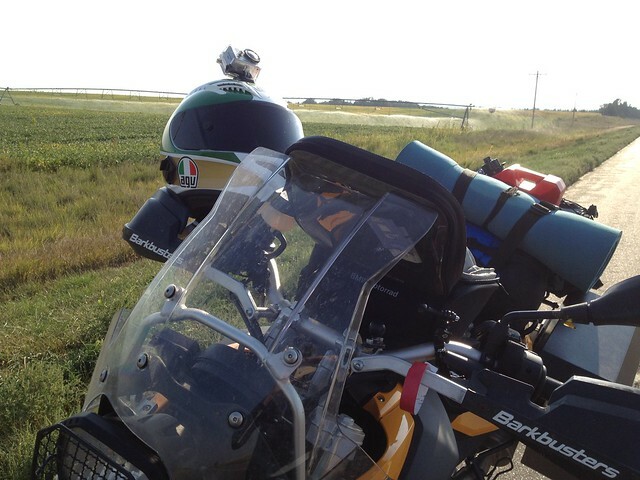 The vast openness of the Great Plains allows heavy cross winds that make it challenging to keep the bike and my helmet stable while looking sideways towards the fields. 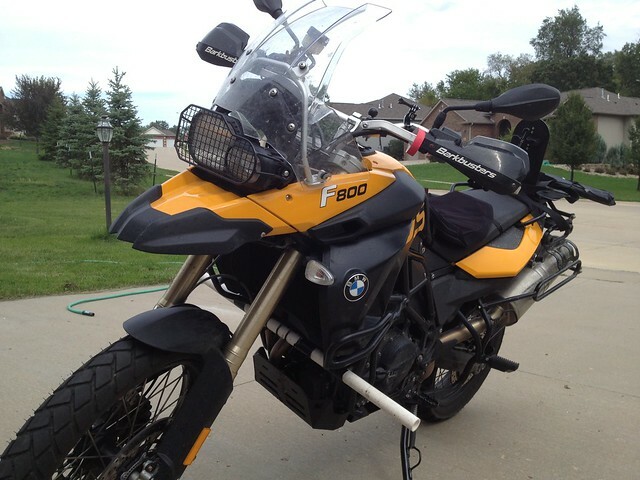 Maybe I should mount the camera on my handle bars instead of on the helmet. 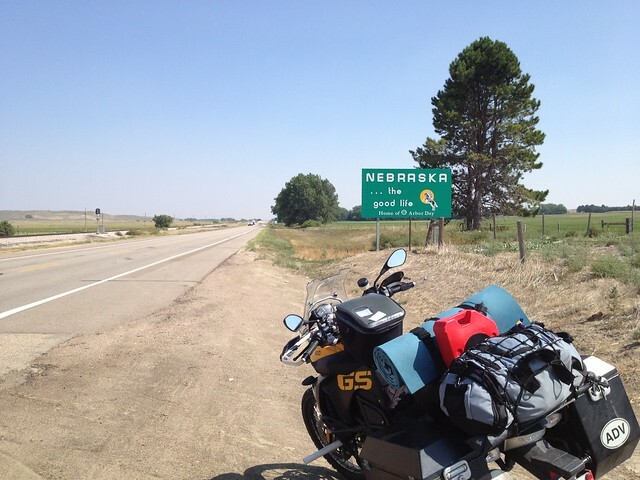 I crossed into Nebraska by around half past two. 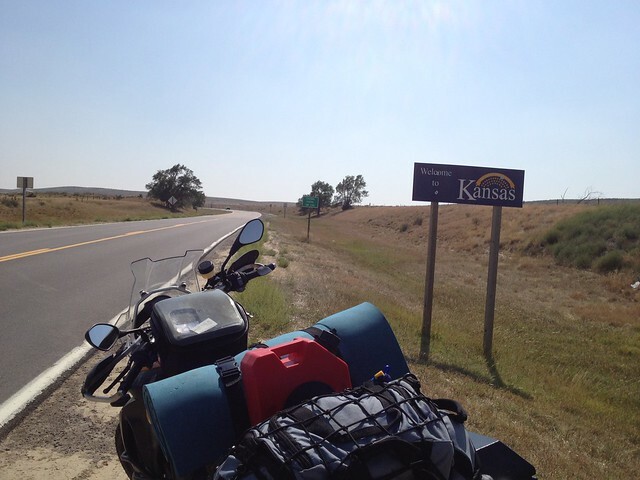 Right after that a quick half mile detour from US 34 on NE 27 got me to the Kansas state border. It certainly didn’t feel like cheating to stake claim to another state travelled. The heat and the monotonous countryside kept me from stopping and taking photos as I normally do. I forced myself to stop once and got a bunch of photos and didn’t stop again. Another issue with the route was the complete lack of data network and spotty cell phone network. I usually book a motel for the night the previous day. Having forgotten to do that and the lack of network I called my friend Karthik in Phoenix to book a room for me at Hastings Nebraska, 20 miles from Grand Junction. 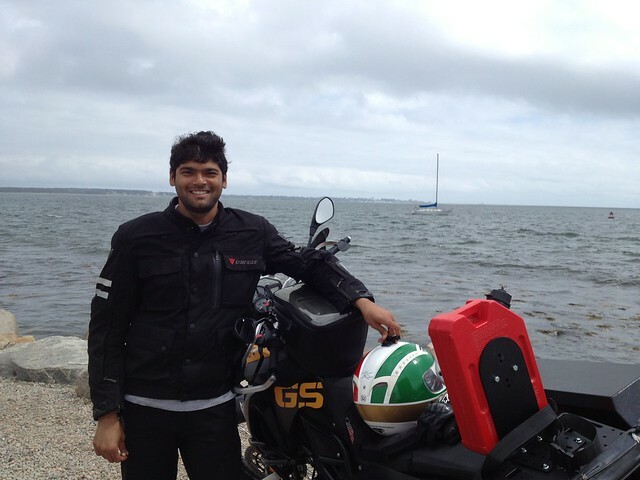 Karthik has been counseling me on the routes and has helped me plan quite a bit. He has great expertise since he has traveled the length and breadth of America many times. Here is a link to his flickr albums. By around 6:30 pm I was about an hour away from Hastings and the sun started to set. The temperature dropped and the hot air turned into a cool breeze. The slanting sun rays from behind my back colored the brown fields golden orange. My constant thirst for water and need for speed disappeared as dusk settled in. 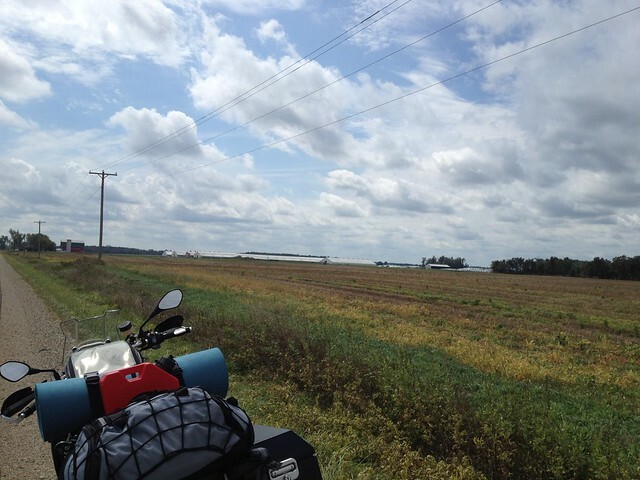 I relaxed and felt the tiredness melt away and the boring corn fields suddenly appear interesting. I noticed the moon rising over the horizon as the setting sun behind me casted longer shadows. While I watched my shadow grow longer and longer until it blended with the dark road I rolled into Hastings and into yet another Gujju motel. I slept through my alarm today and was woken up by a message from my cousin checking to see if I am on schedule to make it to her place today. I was half hour late but the thought that I would be riding home and will be getting a break after 6 days of continuous riding gave me the extra spring in the step needed to get onto the road in record time. 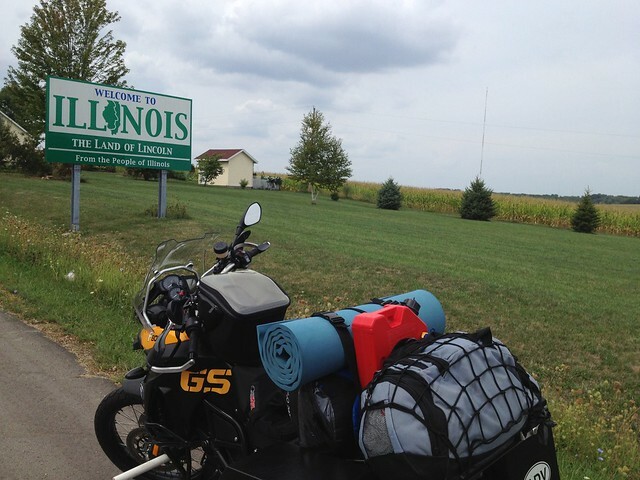 Last night I had decided to ride the interstate I80 instead of the longer US Hwy 34 to Iowa to get home sooner by two and a half hours and also to avoid getting stuck in a probable thunderstorm. I stopped for a quick coffee and muffin at a food stop near the outskirts of Hastings. I wolfed down the muffin while watching a bunch of old retired folks getting together for what seemed like their favorite pass time; gossiping. One group was discussing a strange phone call from a persons daughter where she just said sorry again and again but didn’t tell why. Another old man was proudly showing printed photos, of his family maybe, to the rest of the group. An all lady group was discussing cars! I got onto the road expecting to see thunder clouds in the distance but the sky was utterly cloudless as far as I could see. This meant more of the same hot weather as yesterday. I made sure all the jacket vents were open and got ready to face the heat. Karthik had warned me about cops on the interstate so I made sure not to speed. Sure enough, within half a mile on the freeway I saw five cars pulled over for speeding at the same time. Quite a sight I must tell you. I didn’t speed the whole ride today. The ride today was much like yesterday’s. It was hot, but in the low 90s which was tad better than yesterday. The scenery didn’t change. 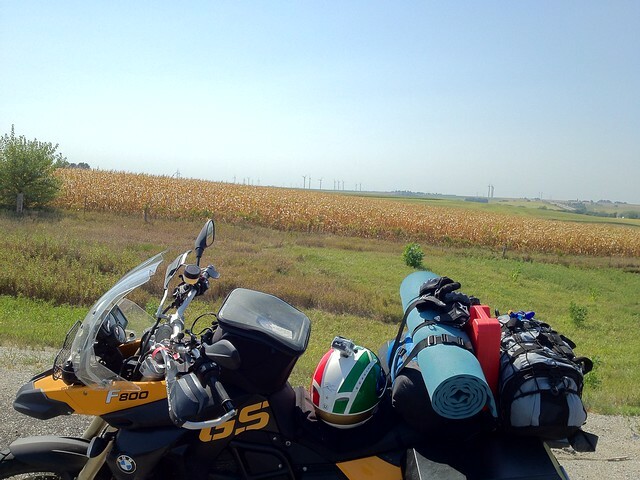 It was more of the same small rolling hills covered with green and yellow corn fields. Only this time the view was continuously disturbed by the huge semis and trucks. They also make the cross winds feel stronger and cause whip lashes. Riding with this wind is quite a workout. I found some respite to the heat whenever I passed a field with the sprinklers on. The sprinkler system and wind would create a thin cool mist that overflowed on to the freeway. The welcome to Iowa board was hung high above a bridge across the Missouri river which forms a natural border between Nebraska and Iowa. 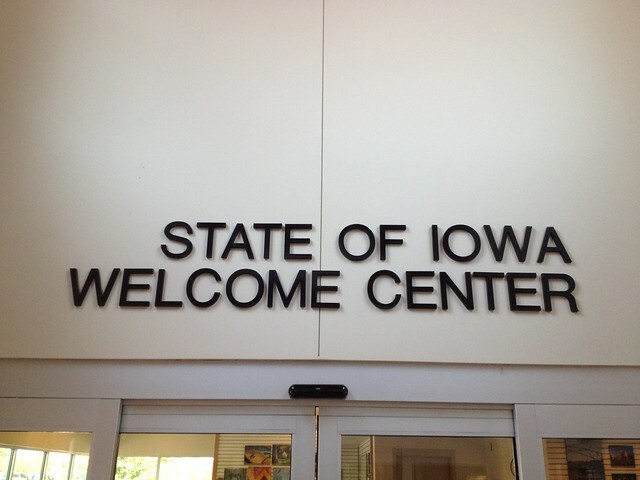 I had to make do with a sign at the state welcome center. There were just a couple of noteworthy sights today. One was the sheer number of gigantic windmills doting the countryside. Looks like Wind energy is harnessed to its full potential here in Iowa. The other was how pro life the midwest is. I saw many signs abhorring abortion and choosing life along the road near towns. “With an abortion something inside you dies”, “Smile! You parents chose life!” and “If you are pregnant then it’s a baby” are a few that I can remember. As I near my cousin’s home I am filled with conflicting thoughts. I am not sure if I want to continue blogging or even noting things down. Somehow I end up thinking about how I would describe the moment in my write up rather than enjoy the moment unadulterated. Beats the purpose I think. Though I am not sure if I can turn those thoughts off even if I am not writing. I will probably leave the choice to chance. It feels good to be among family. I ate well and ended the day watching my niece show of her cartwheeling skills and my nephew his burping skills. Looking forward to some good downtime. 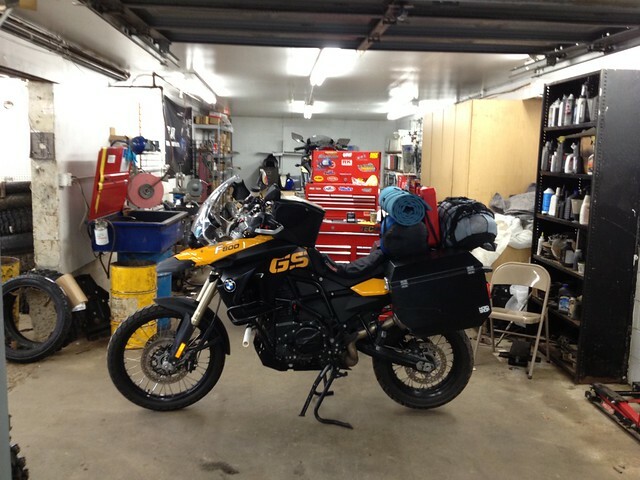 After a good 3 days of rest and taking my mind off riding at my cousin’s home I decided to head east once again. The conflict between the burden of properly describing my experience and actually having the experience itself resulted in a dry spell for a few days. I have no write-ups from the next couple of days. I do have photos though which some say are worth a thousand words. 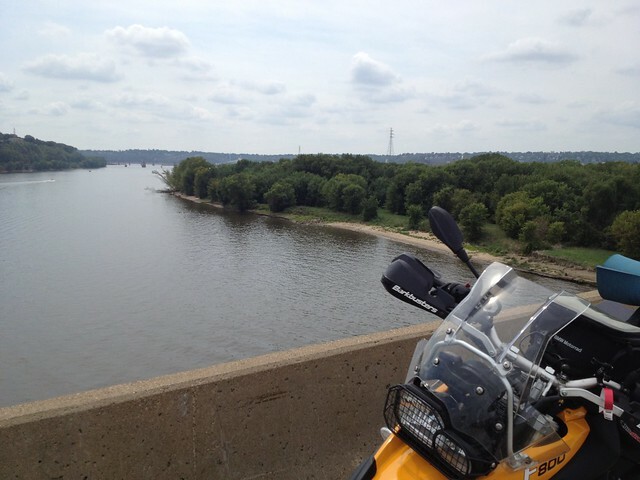 Crossing the mighty Mississippi at the border of Iowa, Wisconsin and Illinois. A quick photo shoot in Illinois. The three states meet each other at Dubuque on the banks of the Mississippi. The beautiful, meandering Wisconsin River. 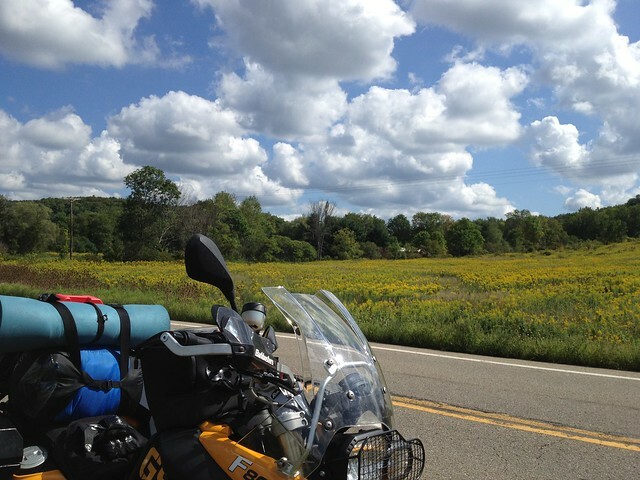 It was a great joy riding along the Wisconsin. It played hide and seek while I rode alongside it. I made my way to Milwaukee on the banks of Lake Michigan. 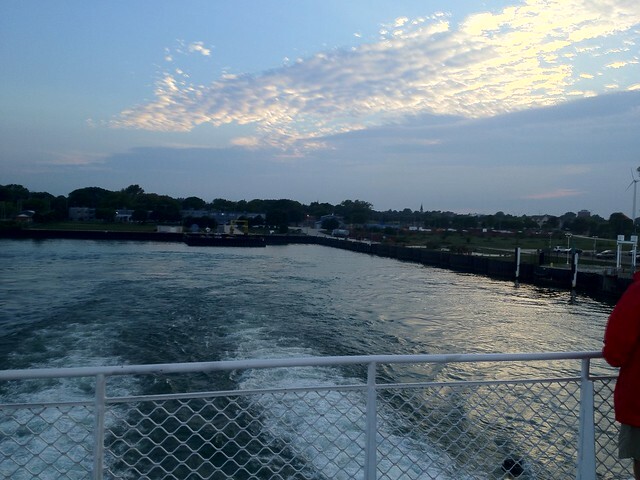 I had decided to take the ferry across Lake Michigan to Muskegon, Michigan. Here I am waiting first in line to board the Lake Ferry Express. I stayed the night at a friend’s place in Grand Rapids, Michigan. 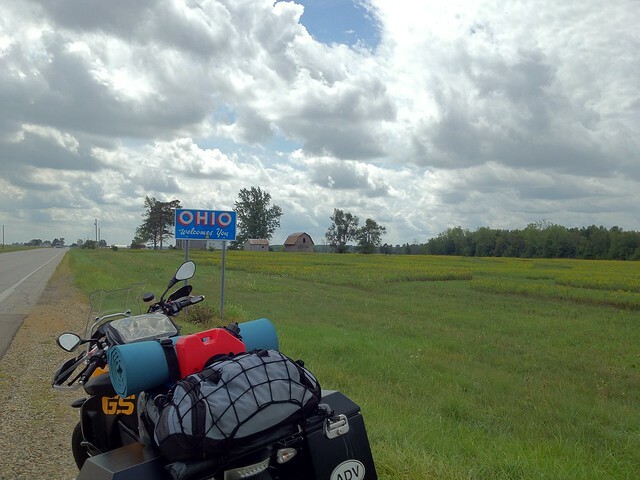 Incidentally my friend was moving to Cleveland, Ohio today and I decided to ride along and check out Cleveland. I took the longer and scenic route. Low hanging clouds over Michigan countryside. 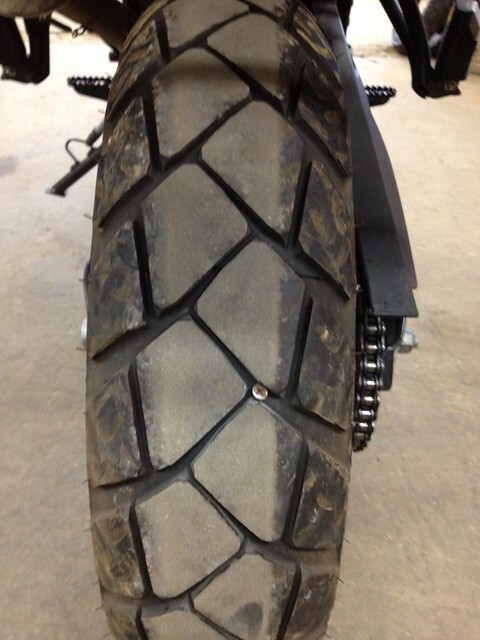 The customary state board photos, a must for the modern day motorcyclist. Here are two in one! The view from my friend’s apartment in Cleveland downtown. 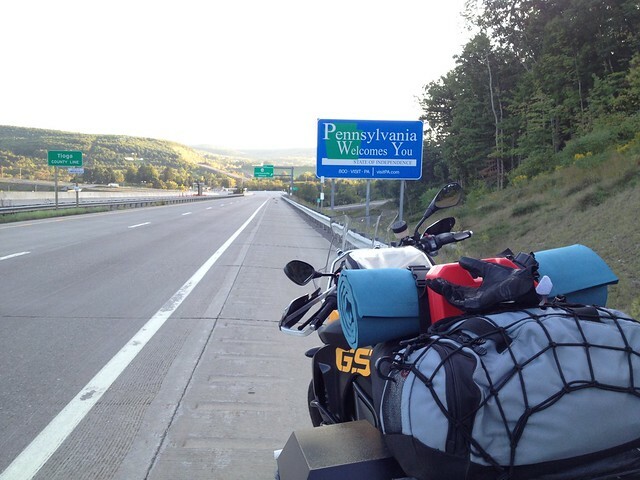 I reached Painted Posts NY from Cleveland Ohio after a long ride through back country Pennsylvania, US Hwy 6. I passed through around 30-40 villages watching; people read newspapers at their front porches, dry clothes out in the open, kids wave at passerbys from ice cream shops, beautiful cattle ranches, small lakes with waterwheels and some good roads flanked by the greenest wild pastures I have seen. 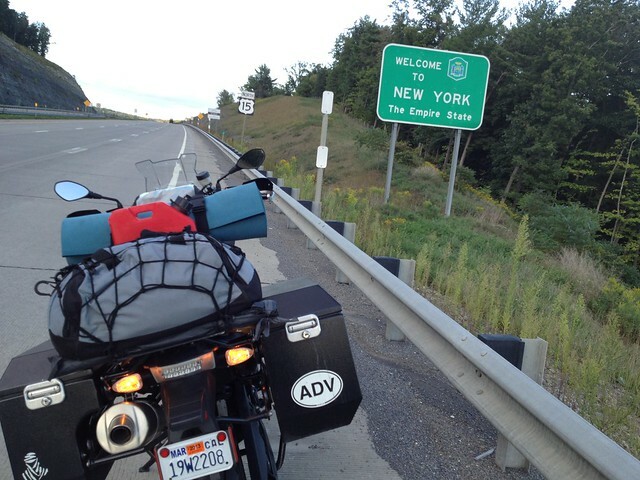 I crossed into New York today. Tomorrow will see me reach Connecticut to another cousin’s home and a possible end to the journey. I am about 300 miles from the east coast. Can almost smell the ocean in the air! I reached Hamden Connecticut today with a slightly different proceeding for the day than usual. I set out with 300 miles for the day and just 200 miles away from Hamden, somewhere in Upstate New York, I got a flat in my rear tire. 4000 miles and 16 days into the ride and I get one on the last day. That’s what was missing from the trip. I got this flat right after a call from my manager at work asking if everything was alright and when I would be back. Pretty interesting juxtaposition of events. Luckily I was close to an exit on the interstate I86. I managed to take the exit and stop. 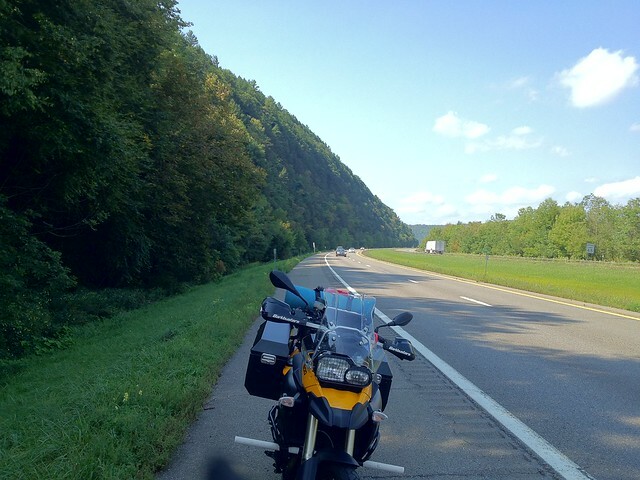 I ended up on a slope because of which I could not get my side stand out and had to hold my bike up till the AAA towing truck showed up. 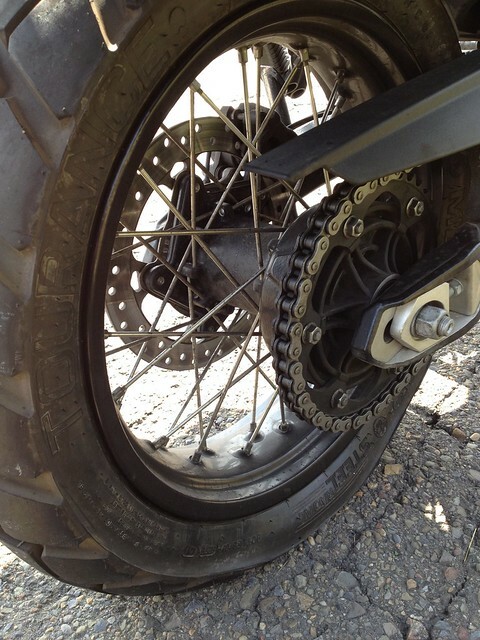 A local mechanic at the Kawasaki dealer fixed up the flat while talking about his brief stint in the robotics industry. 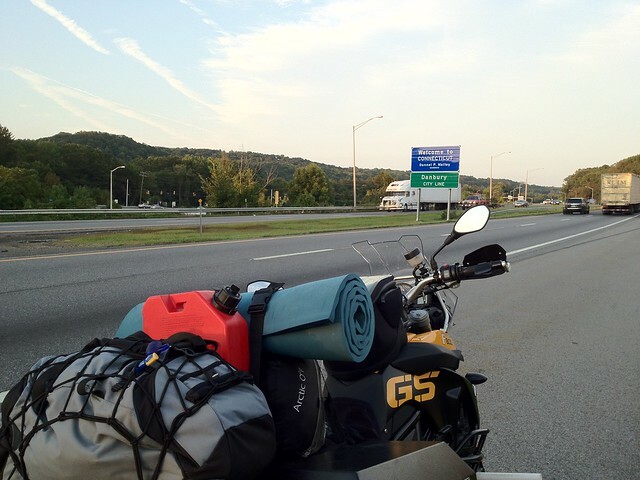 The whole process was pretty painless albeit long enough to make me ditch the scenic route and stick to the highways all the way to Connecticut. 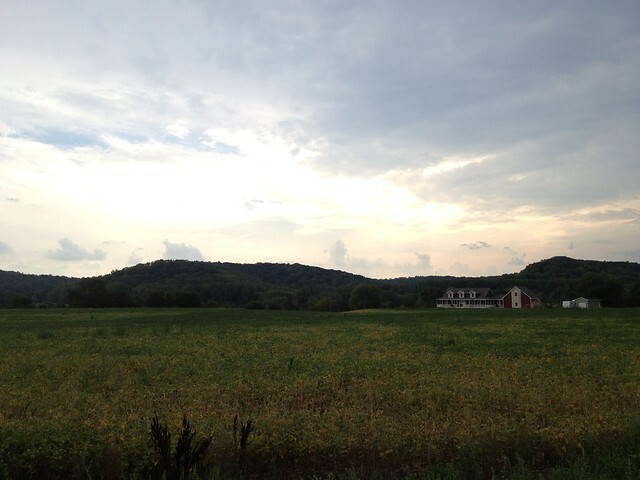 However, Upstate New York’s beauty overflowed onto the freeways and made my ride to Connecticut quite breath taking. The image of New York has always been NYC. I am hoping the green Upstate New York takes its place. 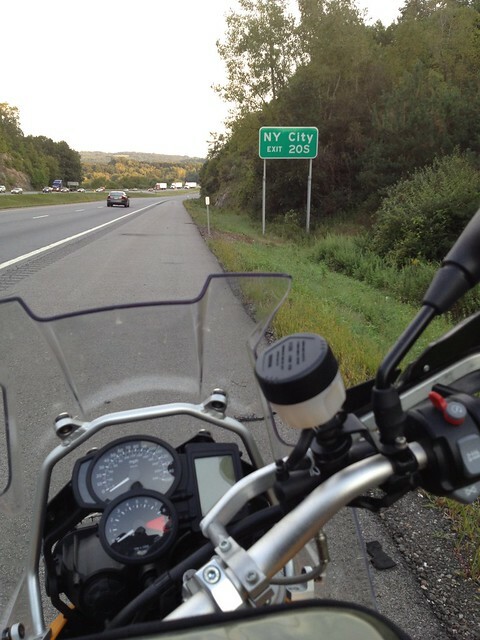 I got very close to NY City. It was very tempting to ride there and stake claim to some iconic landmarks. But the thought of riding through the dreadful city traffic kept me away. I entered Connecticut around 7 in the evening and was soon home at my cousin’s place in Hamden, Connecticut. So, here I am 16 days, 4,000 odd miles since I left San Jose. I am about to end my journey. I somewhat feel satisfied with the ride and don’t have an itch to ride back. I will probably truck the motorcycle back and fly to San Jose. I will spend the next few days resting and preparing for the return trip. 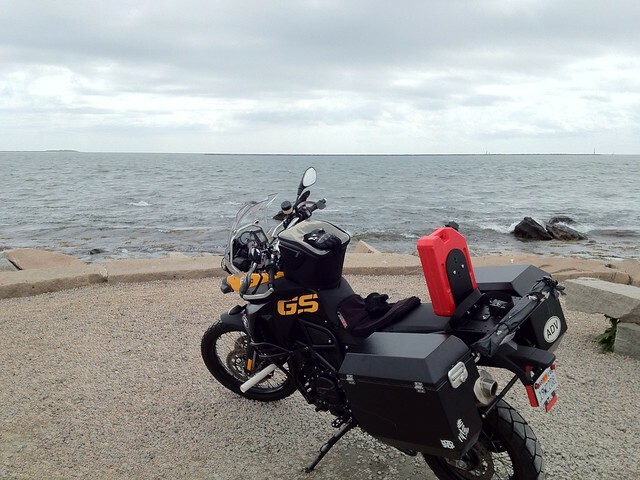 I will probably ride towards the coast sometime this weekend and get that photo with the Atlantic Ocean. So, today I made the token ride to the “East Coast”. 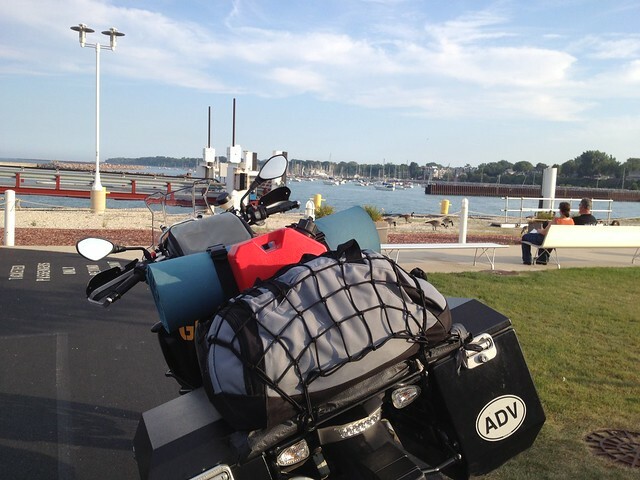 I rode north from Hamden CT towards Rhode Island looking for a scenic spot where I could get a good shot though the complete cloud cover over all of New England made that very unlikely. I branched off from the interstate I95 at Mystic CT onto Highway 1 which like its counterpart on the west coast runs along the eastern coastline. I kept riding along highway 1 but couldn’t find a decent spot with a clear shot of the Atlantic. All views were cluttered with docked sail boats and sea side restaurants if not large warehouses. I finally decided to ditch the highway and veer into the small towns doting the coastline. I happened to pick Stonington. Stonington is a small town with a downtown no more than half a mile long with narrow streets, many of which were one ways. I figured that if I kept going east I would have to end up somewhere with a view of the Atlantic. And I did. Serendipitously I ended up at an almost empty pebbly parking lot with a clear wide view of the Atlantic. To my left was a Rhode Island peninsula and to the right was the north end of Long Beach. There was a great break in the clouds which cheered up the whole scenery. Sail boats, speed boats, kayaks, ducks and birds were spread out far and wide adding character. I took the photo I had waited so long for and sat on a bench to take in the cool sea breeze and gentle sound of the waves breaking on the rocky coastline. I waited for an epiphany but none came. I wonder why we associate arduous travels and grand visions of nature with revelations from deep within. Movies and other media have sure built up that expectation. This was a tough journey. I traveled through myriad geography with unique challenges and a glimpse at my reaction to every bit of it. 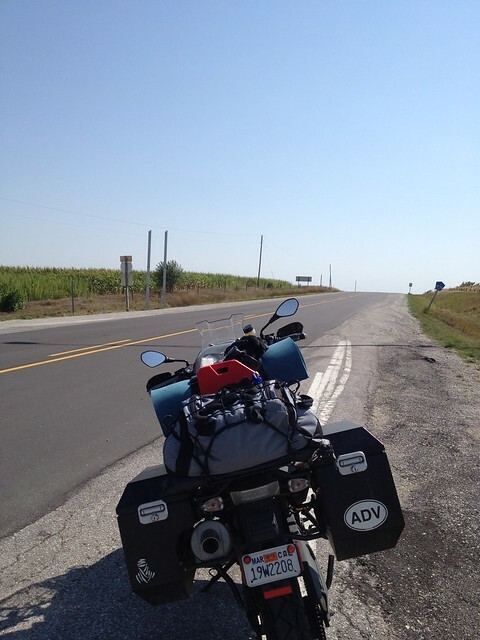 However, the trip was the toughest on day one when I first got onto the motorcycle at San Jose realizing the fact that I am venturing into the unknown. From then on it was one mile at a time, one day at a time and just enough motivation to pull myself to the bike each morning. I will end the blog with a summarizing thought. It is a thought that beckons more journeys, within and without. Both are very important. One to see the world we live in and the other to see the way we see it. Beautiful travelogue! Can’t wait to do a cross-country drive some day. Thanks! Do it at the first opportunity you get!